Losing weight has been the topic of discussion all around the world since adult and childhood obesity was brought to our attention. While obesity was present before the test results, losing weight was a closeted topic. Now, everyone and their brother are trying to lose weight quickly, and hopefully healthily. But what those diet plans and nutrisystem meals aren’t telling you, is that you need to go back to the basics. Drinking 8 cups of water a day is elementary when dieting, yet we all struggle to get it into our bodies. I personally hate drinking water, and try my hardest to get four cups a day. It’s difficult, but that doesn’t mean that you give up. Taralynn McNitt runs a blog titled Undressed Skeleton, where she shares her healthy story along with ideas and plans for eating, exercising, and lifestyle tips. She, too, has issues with drinking water, and has found a plan that works. So go get your water bottle and a sharpie, because we’re about to time out your drinking ability. Yes, I said timing. All you have to do is write on every 8-ounce line with the time you wish to complete it. 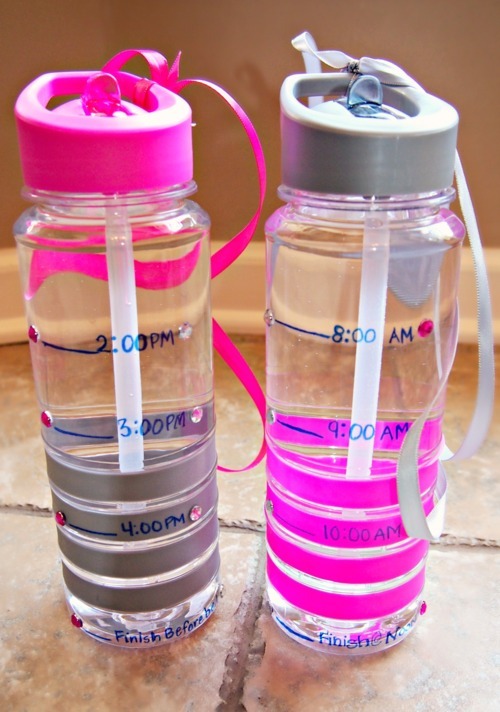 If the bottle doesn’t have ounce increments on it, pour a cup of water at a time in the bottle, and mark the line. Simple as that. In the picture above, there are two water bottles; one for the morning and one for at night. Taralynn wrote down hour increments per cup and that’s what I personally think is a great idea. I’ve written on my water bottle just to keep myself on a schedule, and it’s been nothing but beneficial. Yes, you can still drink coffee in the mornings and during the day, but remember that those 8 cups of water are just as important, and might even give you more of an energy boost than that cup of coffee. Water helps your body function and it can help you lose those extra pounds your trying to shed. Try it out and get on a schedule. I bet it will make a difference.